Hello again. There’s one thing I forgot to mention on the last post. On Monday night, there was a crazy dry lightning storm that could be seen from campus. It was decently far away, so there wasn’t too much danger. 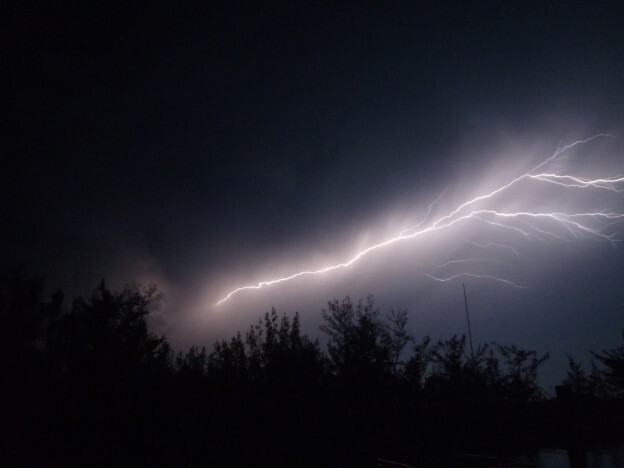 Lightning danced horizontally across the sky, lighting up the boathouse dock where many of us watched. I have to say it was one of the coolest things I have ever seen. This photo is by Cole Vanacore. Thursday, April 4th, kicked off with an average morning exercise. Swim track had interval training while run track ran about four miles on The Loop, cutting across Sunset Beach for the view. We had classes afterwards. It was my Human Ecology class’ turn to help cook. We pulled the left over pork from Wednesday’s dinner to make tacos for lunch, and filleted Tilapia from CEI for dinner. It was nice to experience what the kitchen ladies do for us each day. Normally on Thursday afternoons we have Community Outreach, where we go down to Deep Creek Middle School. However, as our buddies at Deep Creek are on Spring Break, we had dorm bonding instead. First, Boys Dorm had a meeting in which we elected our new dorm head. Congratulations to Jack Martin, the new dorm head! A ceremony led by our former dorm head, Charlie Mauck, was performed to officially swear Jack in. For dorm bonding, Girls Dorm practiced their song for Coffee House, while Matt taught a bunch of guys from Boys Dorm to play rugby on the beach. Overall it was a really fun day. As we did not have one on Wednesday, we got a sleep-in on Friday morning. In the community meeting afterwards we discussed the importance of leaders and followers in a movement, and the traits they should have. Community meeting was followed by research and classes, during which we noticed a large storm cloud starting to hang above our heads. Right as we got out for exploration time, it started down pouring rain. It lasted all night, and we had to sprint from building to building. By the end of the night, we had gained almost 30 cm’s in Boys’ Dorm cistern! We will have plenty of fresh water for the next couple of weeks. We had a night class for Human Ecology where watched the documentary, “Flow.” It was an interesting film about how the water industry has been privatized and dominated by three main companies. It was a great day, and we went to sleep to the sounds of pounding rain.